We often get questions from new users on the use of “shorts” and “longs” sweep assessment in cruising dictionaries such as RAD05, RAD05A and RAD06. It is worth a few moments to understand the history and versatility in assessment sweep in this way during MARVL (Method of Assessing Recoverable Volume by LogType) field inventories during pre-harvest or mid rotation inventory. The concept of separating sweep into “Longs” and “Shorts” codes for what is essentially the same sweep classification (e.g SED 1/4 assessed over 6m), was included because having just the one sweep code (e.g. SED 1/4 assessed over 6m) failed to distinguish stems which were only acceptable for a series of short logs, from superior stems which could be cut into long log lengths of the stem grade quality. In NZ this is commonly allied to differienate between typical domestic sawlog length of <=6.1m and long export grade lengths upto 12m. In Australia the longs and shorts codes have often been implemented to differentiate between long <=4.6m and then upto 6.1m. For this example I will try and demostrate it’s use commonly in NZ. But the same applies for several of the cruising dictionaries used in Australia just for these different lengths combinations. On paper, this may seem illogical, because as noted above the sweep requirements are essentially the same. However, in practice you’ll find plenty of trees that are quite acceptable for SED 1/4 for every 6m in the stem, but that would not be acceptable for 8 or 12m logs due to double or multiple sweep in 2 or 3 directions over longer 8 to 12m lengths. Generally the reason would be some sinuosity or wobble that is enough to put it out of a 12m log, but which would be quite acceptable if cut into 6m or shorter logs or SED/4. Obviously, severe wobble, unacceptable in shorts, needs to be accurately noted in the stem description, but the sinuosity or wobble I’m referring to above doesn’t warrant description as wobble or even a short section of SED/3 (rough sawlogs). Trying to describe it accurately would take significantly more time in the bush, and placing a section of wobble in the description can needlessly limit the options for optimising the stem. It has shown that this technique has a long history, is fast and it works for separating out these types of log products. The use of shorts and longs style codes dates back to the late 90’s in MARVL dictionaries of that era. 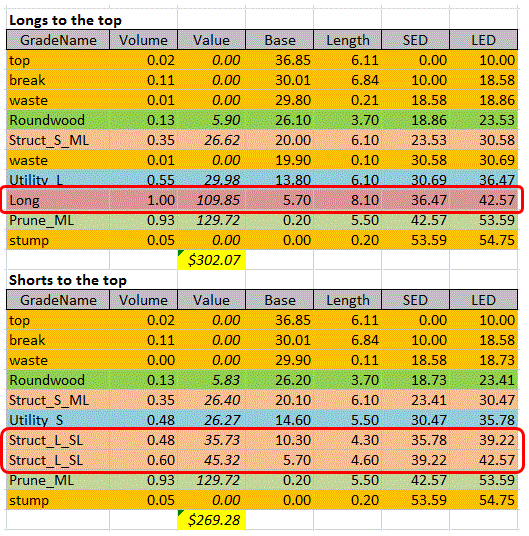 As highlighted below in Figure 1 the sweep classifications used in RAD05,RAD06, and RAD05A all deploy this common concept of “sawlog sweep” being split into Longs and Shorts. 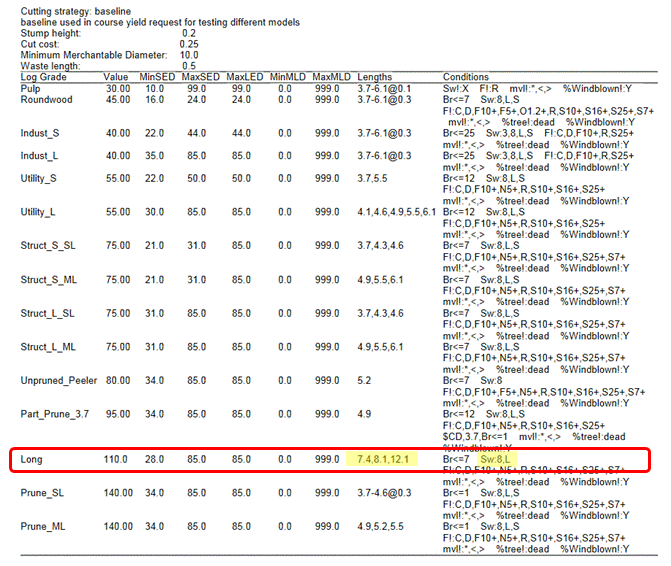 Figure 1 – Extract from the RAD05 Domain File (*.YTD) in YTGEN showing the definition of Sweep for Longs and Shorts. In this deployement the “shorts” are used for sawlog lengths equal or shorter then 6.1, while “Longs” are used for long-sawlogs up to 12m going on SED/2. “Shorts” is a gentle single sweep sawlog over a 6m length length, but when extending further than 6m results in a small amount of sweep in more than one direction. “Longs” being a single gentle sweep sawlog, with movement in one consistent direction. Figure 2 – Extraction from the field cruising quick card for RAD05, showing the definition of movement. The effect in calling shorts and longs are therefore connected to the log market e.g. with a call of “longs” you can therefore produce logs longer than 6.1m which gives you more flexibility as a forester and better predict the longer length logs. Without this code it is very easy to over predict columes of these longer longs. Figure 3 – Long log example with Sweep codes of Sw:8,L only. Figure 4 – two similar trees with different sawlog sweep classes – longs vs shorts. The two trees are cut into logs and produces below output as shown in Figure 5. Figure 5 – Output from the trees shown in Figure 4 and cut up using the strategy in Figure 3. In relation to value there is a 10% difference between the short and long scenario, even though this is just an example it is typical of type of value difference you would expect and even on woodlot level (1-3ha) it would amount to a significant price difference. So the lesson learned within above theoretical scenarios is you should always chose as many options as possible, calls related to shorts and longs gives you the opportunity to choose and segregate between gentle sweep, for shorts these can be moving back and forth and for longs in one constraint direction.